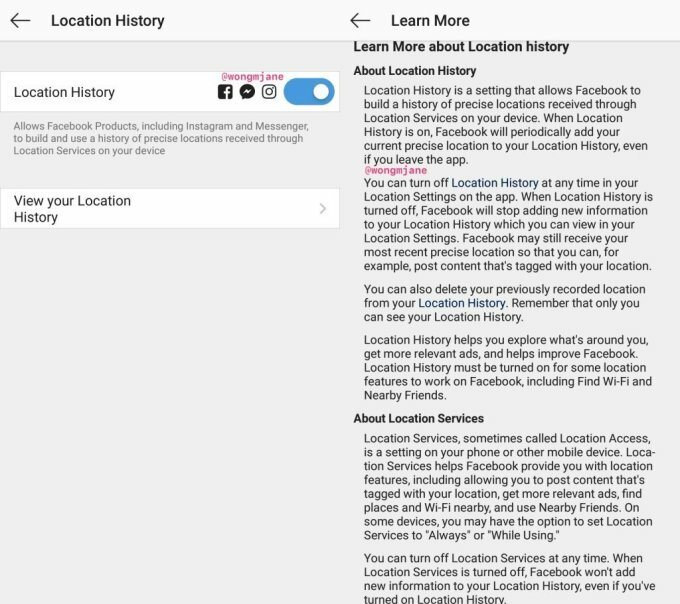 Sharing Instagram Location History With Facebook? Now that Instagram’s founders have resigned from the project, expect Facebook to sync their teeth even further into Instagram. Since Facebook’s acquisition of Instagram there have been major changes to the platform. In a recent finding Instagram Location History is being tested as a new feature that will share data with Facebook. The goal of this is to suggest more location specific content to users. What does this new feature mean for the platform as a whole? Facebook has a long history of collecting data from it’s users. However, Facebook has been walking on thin ice since the Cambridge Analytics Scandal. Recently, even the cofounders of Instagram have left the platform. Consequently just prior to the release of some of these major updates. After continuoulsy butting heads with Facebook, the cofounders of Instagram decided it would be best to leave. Close friend of Mark Zuckerberg and VP of Facebook News Feed, Adam Mosseri is now the new Head of Instagram. Facebook is now taking over the healm at Instagram and some critics fear they’ll use Instagram to drive referral traffic via spammy notifications, over saturation of ads, and of course collecting more data mining. Facebook has been known to intertwine social data from their other applications, in example, the $122 million dollar lawsuite by WhatsApp for breaching their privacy agreement. This recent protoyping of data collection on Instagram could be the loophole Facebook needed to reinvigorate data collection. The new privacy setting aims to deliver more location specifc content & ads to your feed. This recent development could be a direct affect of the rising numbe of small locally owned startup businesses. Facebook is ad revenue driven, meaning they will bend over backwards in order to ensure that there is a heavy involvement of brands/businesses on the platform. If this feature goes public on Instagram we could see a massive increase in the amount of ads shown on the platform. My second thought is this: The new location tracking will be an invasion of users privacy that could help start the launch of Instagram as a social market place. Think about how these location services could be useful for the rising side hustle of reselling products. In the same fashion that Facebook Market Place uses your location to show you relevant products for sale in your surrounding area. The location services being prototyped on Instagram could be used to do just that. 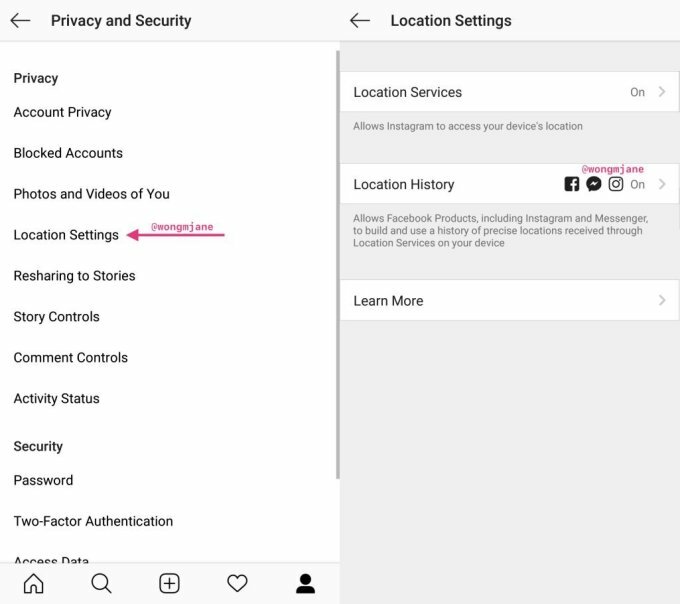 In addition, the recent Instagram leaks about a “Shop” tab on the explore page could be a direct result of the implimentation of these location features. As a dedicated Instagram Influencer and reseller, I would be willing to give up location data in exchange for the ability to find people in my area interested in buying. This is the same exact reason why applications like Let Go, Offer Up and others have seen such success. 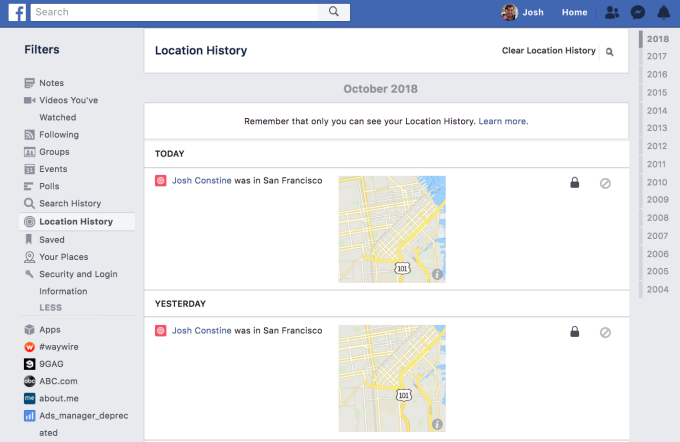 As we can see Facebook Plans to create a Daily Location History Map to showcase where you have been throughout the day. Not only will Facebook show you where you have been while using apps like Instagram or Facebook, they’ll also be collecting your data location even when you have the applications closed. 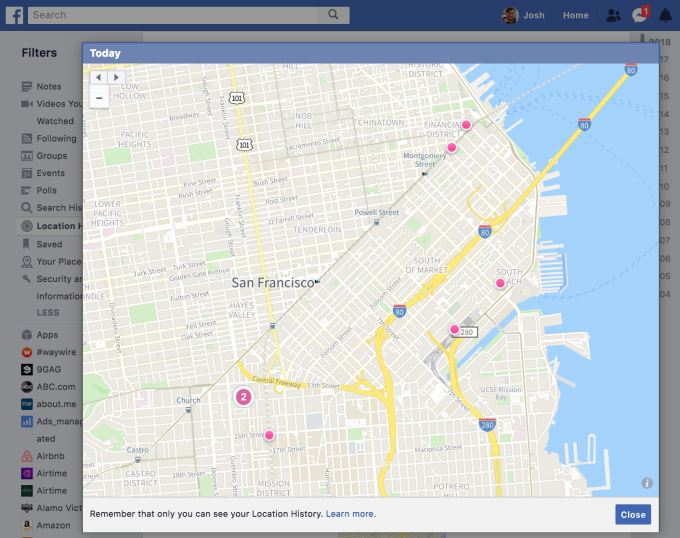 These new daily location history maps will be stored in user profile history on your Facebook. Under the Privacy and Security Settings, you can find Location History. Upon closer examination with a “Learn More” button, you are going to see some creepy information about your location history. These screenshots come directly from TechCrunch Tipster Jane Manchu Wong. Instagram has already began the prototyping phase on select accounts. This new feature appears to be the testing phase. More udates coming soon as to the full release of this feature. With the cofounders of Instagram gone, Facebook is going to do a full remodel of the platform. It is going to become more brand & business oriented. This new location settings as a data mining tactic is just the begining. However, Facebook has a long history of collecting data from its users and there are still millions of dedicated users every month. Will this integration of data mining kill Instagram? Most likly not, my thoughts are this is the begining of Instagram as a Social Market Place.